yes! I've done it! 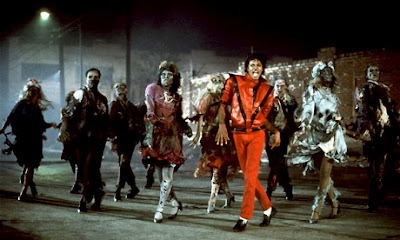 I learned Thriller. just in time to enjoy for Halloween. as you can tell, I'm pretty pumped about that. and now I'm gonna teach it to anybody who so desires to learn. told ya I got the moves. Geri, this is me calling for a dance lesson! I can't wait to learn this dance so we can do it for our next family party's entertainment! i LOVE this dance!! i learned it in high school but i just might need a refresher course!! i think it's great that you learned it! Geri, you're great! I'm impressed you have so many talents! It was fun to see you guys last night! Yea, I'm with your Mom--we want to see these moves. You need to video tape and blog this one!